I made this red, white, and blue dessert for the 4th, but I don't see any reason why one shouldn't want to make this at any point when berries are in season. Actually, you could make this all year with whatever seasonal fruit you find delicious and complimentary to cake and cream. The thing about trifle is there are a lot of cheats and its endlessly versatile. Certainly, there are trifle purists out there who know better than I do, but in my humble opinion, make trifle however you please. If you aren't in the mood to make things from scratch, you can buy pre-made pound/sponge cake and whipped cream (or whipped topping). If you don't feel like using traditional jelly or custard, you can skip those things (I did). If you don't have fancy liqueur on hand, use fruit juice instead. Then it's just a matter of layering the things you have chosen to use in a dish or bowl. It's nice if the serving dish you're using is clear so that you can see the pretty layers, but anything that will hold cake, fruit, and cream will suffice. 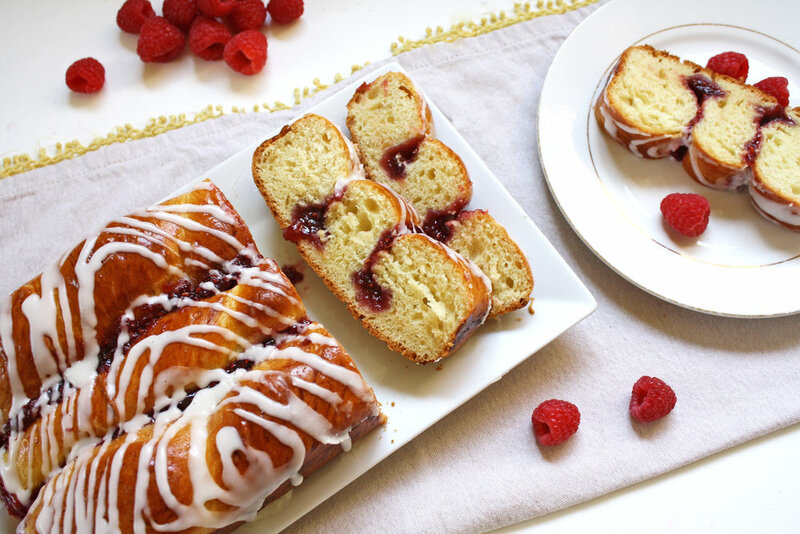 For this recipe, I made my own lemon pound cake (recipe below), I chose to drizzle the cake with Chambord instead of Cointreau (raspberry liqueur instead of orange liqueur), and I made a whipped cream with very little sugar. The mix of subtle lemon and raspberry flavors worked well together, and although certainly decadent, there's something refreshing about this this dessert. Start by prepping your trifle ingredients. Wash your berries, and lay them out to dry on paper towels. Trim the ends off of the strawberries. Cut your cake into squares or any shape you like best. In a stand mixer or using a handheld blender or whisk, whip together 1 16-ounce container of organic whipping cream, with 1 teaspoon vanilla extract, and 1-2 teaspoons sugar. I don't like super sweet whipped cream, if you prefer yours sweet, add more sugar. You can taste the mixture as it whips and add more accordingly. Once whipped, reserve in the fridge. You can substitute homemade whipped cream with a store bought whipped topping. Layer the cut up cake in the bottom of the dish. Drizzle 3 tablespoons of Chambord over the cake. Slice strawberries and layer them evenly over the first layer of cake. Put another layer of cut up cake over the strawberries. Drizzle the cake with 3 more tablespoons of Chambord. Chill 2-3 hours before serving, or up to 8 hours. I adapted Ina's recipe and it makes 2 loaves. I only needed one loaf for the trifle, so you could halve this recipe, or make the whole thing and have the joy of an extra cake in the house. Preheat the oven to 350°F. Grease and flour 2 (8.5 x 4.25 x 2.5-inch) loaf pans. Cream the butter and 2 cups granulated sugar in the bowl of a stand mixer fitted with the paddle attachment, until light and fluffy, about 5 minutes (you can also do this with a hand mixer). Don't skip this step. Having your ingredients at room temp, and taking the time to whip your sugar and butter into something light and fluffy are two key components to successful cake baking. With the mixer on medium speed, add the eggs 1 at a time, and then add the lemon zest. Beat together for another 30 second or 1 minute. While the cake is baking, combine 1/4 cup of granulated sugar with the remaining 1/2 cup of of lemon juice. In a small saucepan over low heat, heat the mixture until the sugar has fully dissolved. Turn off the heat and reserve. Once the cakes are done, allow them to cool in their pans for 10 minutes. Take them out of their pans and place them on a cooling rack set on a sheet pan. Spoon the lemon syrup over the cakes while they are still warm. Allow the cakes to cool completely. It took me a while, but I figured something out: making cake is easy. Once I got over that whole pastry-is-an-exact-science-and-there-is-no-wiggle-room-or-disaster-will-ensue thing, I found that I've gotten a lot more creative and comfortable with the whole idea of making baked desserts. I learned a few key things: 1) the temperature of your ingredients is critical, 2) most cakes are just combos of eggs, butter, sugar and leveaners, you can be slightly off about all those things and stuff will probably come out ok, and 3) keep an eye on things, because no two ovens or batters are the same. There's one caveat to this whole ease business... baking started to get A LOT easier for me once I had the right gear. My favorite piece of gear is the stand mixer. The stand mixer makes me feel like I'm cheating at baking. But even without a pricey stand mixer (thank you older brother for the gift!) cake isn't hard. If you have a hand mixer, or lots of upper body strength and a whisk, you'll be just fine. On Sunday I got in a cake making mood. That day, cherries were the stars of the Hollywood Farmers' Market and I couldn't resist them. I grew up with a cherry tree in my back yard, and as early as six years old I could be found climbing said tree and picking and eating sun-warmed cherries directly off unstable branches. I brought home the cherries, and thought about classic cherry pairings. Almonds immediately came to my mind. I figured I could make a pretty basic cake, replace some of the flour with ground almonds, add some almond extract, and throw some cherries in there. I knew the cherries might sink to the bottom of the cake, but I didn't care. I wanted to keep this easy. If you want to add a step, you can make the batter without cherries, add it to the baking dish, dust your cherries in flour, and lightly place them on top of the batter. They will sink less that way, but I honestly couldn't be bothered. If you can't get fresh cherries, frozen cherries are pretty awesome. I really like this brand, and I snack on them all winter. They'll work in this recipe, so you don't even have to sacrifice your perfectly good-as-is fresh cherries. Long story short: this cake is crazy good. Grease a 9 x 11 baking dish, and line it with parchment paper. Grease the parchment paper. Set aside. In a stand mixture with a paddle attachment on medium speed, cream the butter and sugar together. Beat the butter and sugar until they are light and fluffy. If you use regular white sugar this will take 3-4 minutes. If you are using organic cane sugar it takes about 5-6 minutes. You can also use a hand mixer to beat the butter and sugar. Add the eggs to the butter and sugar and beat them well for another minute or two. In a medium bowl, sift together the flour, baking powder, baking soda, and salt. Whisk the ground almonds into the flour mixture. I ground my almonds in a coffee grinder, you could also use a food processor, or you could just use almond meal or almond flour. Turn the stand mixer to low, and add a third of the dry ingredients to the egg mixture. Add a third of the milk. Alternate the dry ingredients and the milk until everything is fully incorporated. Be careful not to over-mix your batter at this stage. Gently fold in the almond extract, vanilla extract, and the cherries. Pour the batter into the baking dish, and top it with the sliced raw almonds and raw sugar. Bake for 25-30 minutes or until golden brown and a cake-tester or toothpick comes out clean. Let it cool in the pan. Serve for breakfast, lunch, or dinner... it works for all three.